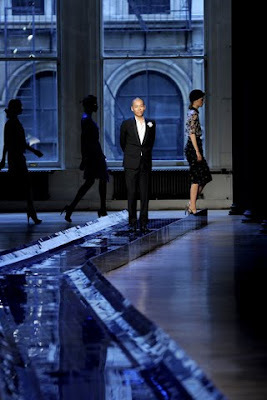 There is a reason why only four years into his fashion career Jason Wu already has 120 retail stores. He knows what he wants, what his customers want, and he knows what works. This runway show launched his fall range of accessories that is going to include shoes, bags and optical. It also gave away samples of his newly released nail polish collections to all who attended his show. The collection for this season is a continuation of his last fall line, which was inspired by the tailored look. There was great sheer blouses and amazing ladylike dresses. Prints, retro, and preppy were also in the mix in the most perfect way. Jason Wu's show was a dream. The whole collection was for every occasion from work to play, going into evening and red carpet.